If you’re new to London or haven’t visited for a while, don’t waste your precious holiday time trying to find out where places are. The best and quickest way to get an orientation of where all your London sightseeing attractions are is to join a hop-on-hop-off tour. 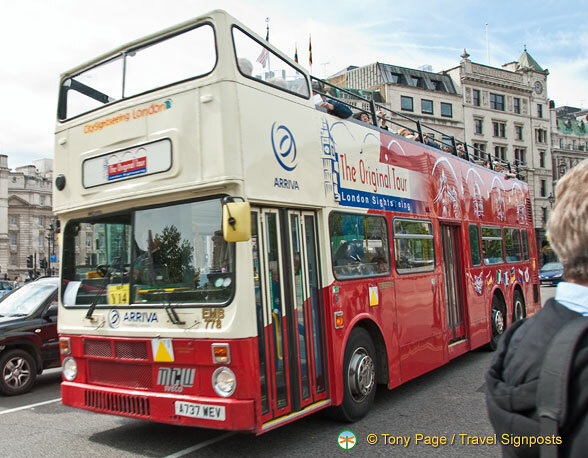 The Original London Sightseeing Tour is one of the hop-on hop-off buses that lets you experience the essential introduction to London aboard the original sightseeing tour. You’ll see all the magical sights of London in a comfortable and secure environment, with full commentary provided.Your ticket also includes a FREE Hop-on Hop-off Thames River cruise as well as three FREE walking tours – a Changing of the Guard walk and a Cool Britannia walk exploring the hidden treasures of Trafalgar Square and central London and a Jack the Ripper walk. You can customize your own London tour by hopping on and off the bus at any stop, as many times as you like. There’s a choice of sightseeing routes, including the Yellow Route which features live on-board commentary. If you’re traveling with the family, take the Red Route – relax while your children are entertained and informed by the highly acclaimed Kids Club commentary and their free London activity packs. Each route makes frequent stops – simply hop off where you want to, and return to the same stop to continue your tour. Your Hop-on Hop-off pass lasts for 24 hours and will be the best value sightseeing tour on your London vacation. By the end of the day, you’ll have a good appreciation of London’s sightseeing attractions and ideas of more things to do in London. Our partner Viator specializes in day tours throughout the whole of Europe. For detailed information of the Original London Sightseeing Tour and booking details, SEE HERE.